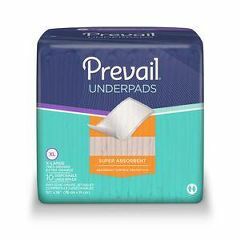 Prevail Nexus Underpads - 30" x 36"
AllegroMedical.com presents the Prevail Nexus Underpads. Prevail Nexus™ Underpads consist of three integrated layers. The heavyweight bonded top sheet provides exceptional strength while providing softness against the skin. A fluffy super absorbent inner layer quickly pulls and locks up liquid away from skin. The outer fabric is water-proof to trap liquid or materials from passing through the underpad. Works great and has a sof. It is a large pad and covers the hospital bed well. Has a soft feel and helps with skin problems.